Thanks to everyone who helped get things done this week! I think we could have a bunch more roles in GNOME. We could have someone in charge of customer case studies, someone responsible for GNOME presentation materials (slide templates, business cards), someone in charge of potential sponsor identification, etc. If anyone sees a common thread of tasks and thinks they are up to, suggest an appropriate title and let the Foundation know you are interested! We now have a donate section on the right hand side of the GNOME home page thanks to Andreas Nillson, Paul Cutler and Andre Klapper. Touched base with John Carr about how the system administration team is doing. They have a team formed that’s been hard at work and have posted minutes from their last meeting. New requests can be logged in bugzilla now. Asked all GNOME teams for Q2 results for the Q2 quarterly report that will come out in a couple of weeks. Pinged a couple of times about GUADEC 2008 finances and heard that Baris is working on the tax situation in Turkey. Prepared slides for my OSCON talk on the role of users in free software projects. Went to OSCON in San Jose for two days. Gave my talk on users in free software projects – it started some good discussions. Met with potential GNOME partners like FOSSFA. Met with a GNOME Mobile member who would like to get more involved. Put lots of faces to names. Hopefully I can remember them all. Attended Open Source for America launch party. The GNOME Foundation is a founding member! Interviewed with Paul Hudson from TuxRadar. He posted some snippets. Full interview to come later. Met with a large financial company who is trying to move to GNOME/Linux desktops. Talked about ways to get their issues in front of GNOME developers for discussion. Look for blog interviews or GNOME Journal articles or something similar! Meeting with Paul Cutler in person to talk about updating GNOME marketing wiki pages. Speaking at a Colorado Springs Linux User Group. finalize 401K plan with attorneys (pinged attorney again – I know she’s been traveling as I saw her at OSCON. In the month of June we raised $1,585, for a total of $18,953 since January 1, 2009. We’ve almost reached our goal of $20,000 for 2009! However, donations in June were down significantly. While donations have been increasing for the past four months, June saw a return to February levels. 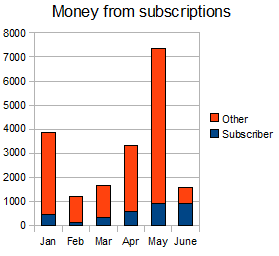 What June does show us is how important the Friends of GNOME subscription program is. We were able to count on those monthly donations which held steady when the one time donations dropped. Here are some graphs that show some of the data visually. 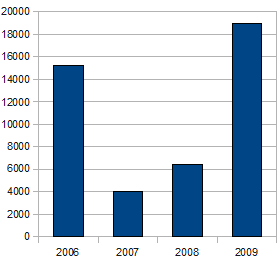 June 2009 was still better than previous Junes, thanks to the subscriptions to Friends of GNOME! And year to date we are very close to our goal of $20,000 for 2009! Pinged sponsor companies about banners that were left behind. Helped draft co-located press release. Read the GNOME Annual Report 2008. Nice job, Lucas, writers and photographers! It was a good year for GNOME. Set up a press interview about my talk at OpenSource World. Wrote my Friends of GNOME post cards. They went to Finland, Australia, Cyprus, and Canada as well as several US states! Sign up to support GNOME with a Friends of GNOME monthly subscription and get a postcard from your favorite hacker! Created some Amazon affiliate accounts in US, UK, Canada and Germany so that Jaap can set up stores and a Firefox widget that will enable people to direct Amazon referral fees for their purchase to GNOME. Talked to a couple of sponsors (Canonical, IBM) about things they’d like to see done and things they are willing to sponsor. Met with Sally from HALO Worldwide. She helps the Apache Foundation with their press and marketing and teaches a class every year at ApacheCon. We talked about how she could help with GNOME marketing and pres. I’d love to have a marketing hackfest and have her come teach a press class. Met with Paul Cutler about all the things we’d like to get going on GNOME marketing, following up on all the conversations from the Desktop Summit. Went through all my email and notes from the Desktop Summit and created an enormous todo list. Create slides for my OSCON talk, the Role of Users in Open Source Projects. It will be based on [Correction] The Role of Consumers in an Open Source Community. Speaking of OSCON, I really like the system they have set up for identifying which talks you want to see, what other talks people interested in those talks are interested in and identifying who will be at the conference and who you’d like to meet. It would be great to have something like that for GUADEC. Tackling as many items from the rest of my todo list as possible. The rest of my to do list. (Let me know if you’d like to help on any of the projects!) These are not in any particular order here. follow up with the sys admin team on setting up better analytics for gnome.org so marketing can make better plans. Spent the week at the Desktop Summit/GUADEC. Met with a ton of people. Putting lots of faces to names. (Some people need new hackergotchis, identi.ca and twitter icons. Me included.) Managed to see a couple of talks too. I have to admit I was most interested in the questions and discussions that the presentations generated. I was very excited that many people reported interesting KDE/GNOME conversations. Realized that while this year I don’t have several hundred GNOME people to meet for the first time, I suddenly have several hundred KDE people to meet … I met quite a few at the Nokia party as I was one of the first (if not the first) GNOME person to show up. Igalia sponsored the GNOME party and didn’t forget our traditions: ice cream death match and jam session. It was a great time! (The whiskey thing happened another night. I decided it was wisest not to attend that party. I had breakfast with some local government and university officials. I sat next to Jose Miguel Santos Espino, the director of the computer science department, and I happened to tell him about the GNOME and KDE folks in Nigeria that couldn’t get visas to come. A couple of days later he contacted me with an excellent proposal. He suggested that we work with their International Cooperations Department to find ways to bring free software to countries in Africa as well as Latin America and Asia. We had a good conversation with Josefa de la Rosa Cantos and we will work with them during their next conference of Spanish and African universities. I also got a chance to talk to Antonio Jose Saenz Albanes who is working a project to deploy 2 million laptops to students in Andalucia. His main problem is accessibility so I introduced him to the GNOME accessibility team. The GNOME Mobile BOF started out the same way that so many GNOME Mobile BOFs do trying to define what is GNOME mobile but we actually progressed during this one which was awesome. GNOME Mobile is a place for people using GNOME Mobile technologies to collaborate. However, we’ll build on the GNOME brand, not the GNOME Mobile brand. We also brainstormed quite a few ideas, like inviting the maintainers for key GNOME technologies to join the GNOME Mobile mailing list. AGM. The AGM went really well even though we competed with many other attractions. All the teams gave an update. We’ll be posting minutes and slides but in the meantime you can check out the GNOME identi.ca feed where the AGM was broadcast live: http://identi.ca/gnome. The marketing BOF was late Thursday afternoon in a really hot room but people had some great ideas. (We were hot! We discussed things like marketing campaigns, audiences (existing GNOME users, not developers), having regional presence on the to-be-formed press team. and we decided we’d put together 4 case studies (GNOME success stories) by the end of the month. Anne Ostergaard suggested the Andalusian school project. Guy Lunardi provided a Novell customer story. I took notes and we’ be publishing soon. Survey. If you haven’t already, please take the co-locating survey. We’ll be deciding next week whether we are co-locating again or not next year. One thing I’ve noticed about the respondents so far is that of the people that collaborated with a KDE person, 95+% think the co-located Desktop Summit was a success. Among those that didn’t collaborate with a KDE person, only 35% think the Desktop Summit was a success. Starting the 20+ hour trip home tomorrow at 4am. Answered several sets of email interview questions for articles about the Desktop Summit. Interviewed several more advisory board members. Tried to get the writeup out before GUADEC but didn’t quite manage. Wrote a press release that was delayed for a while … hopefully it’ll come out in a couple of weeks. Booked travel for OSCON. Short trip to save on hotels and because doing two long trips (GUADEC and OSCON) in one month is too much for my family, especially during the summer. Traveled to the Canary Islands – a long trip. Almost missed my connection in Madrid but thank fully I didn’t and I got to see Chema in the airport. Attended the press interview for the local Spanish press at the Desktop Summit on Friday. They had questions like what is free software, is it as good as proprietary software, could our government be using it, why isn’t our government using it? The local politician we’ve been working with, Roberto Moreno, is a computer science professor at the local university. Went to the board of directors meetings. It was productive even if we were all a bit jetlagged. We welcomed Germán and Diego to the board. (Also, because of flight delays, Diego wasn’t able to join us until later.) We talked about logistical things like minutes and roles as well as things like an agenda for the AGM and other things. Minutes will probably come out shortly after everyone gets home from GUADEC. Pinged about a lot of last minute Desktop Summit details. Most of them are turning out well. Attended the first day of the Desktop Summit. Went to the keynotes in the morning and then spent the afternoon in the press room. Walter Bender and r0ml’s keynotes were great. Walter has a great project and cause and r0ml is a very entertaining speaker. Richard Stallman’s keynote caused a lot of controversy. (It also had a lot of old content and when keynoting, it’s generally understood that you show something new unless specifically requested to regive an old talk.) The local media was extremely interested in speaking to Stallman and I think he probably helped promote free software in the Canary Islands quite a bit. I have a very long to do list. This is only part of it. (Anyone is welcome to help out too!) I’ll publish the entire list in an update after the Desktop Summit. Apply for Amazon accounts in other countries so people can direct referral money to the GNOME Foundation. Fill out Google Grant Adwords application with data from Claus Schwarm. Send out summaries of the meetings with Board of Advisor folks. Work on 2009 finances with nonprofit workshop and Jaap’s feedback in mind. Hopefully with the new treasurer. Work on the new GNOME Foundation sponsorship plan, like premium sponsorship.